Pokhara Multimodal campus is one of the best education environmental campus in Pokhara Sub-metropolis.Different programmes of science, Management. and Humanities in morning and day shift are running since its inception at higher at higher secondary level.It was founded by a team of reputed and learned personalities of the region in 2056 B.S with the objective of providing quality education at reasonable fee.It has been a centre of higher studies for student of this region. In the morning shift, it runs Management, and Humanities in both English and Nepali medium whereas English is the medium of instruction in the day shift for management and science programme as per English capability of students. It is located at Pokhara, Sreejana chowk. Students can easily access to this collage by vehicles or on foot from every nook and corner of the Pokhara valley and nearby. Moreover, it is at the main road that connects the three highways – Prithivy Highway, Pokhara – Baglung Highway and Siddrtha Highway, but which does not mean the noises of vehicles reach to the classes, the classes and the campus environment is still quiet. 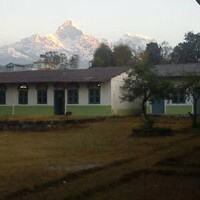 The snowcapped high ranges of the Himalayas, in particular, Machhapuchree (fishtail) peeps from the north, provides a sense of sound and conductive academic environment. The basic purpose of this collage is to impart quality education for the students of the +2 and university levels at responsible fee. It has taken a special place in the academia of Pokhara. Students have occupied a special status in bachelor level programmes of different colleges throughout the nation. We take care of each individual student and communicate his/her academic as well as behavioural aspects to parents and guardians. With this, students have been able to lay a foundation of their academic career. We counsel our students during their stay in this instution and even after the completion of their academic programme. Pokhara Multimodal Campus has introduced the B.B.S programme with the affiliation to T.U. since 2005. The students of the first batch have appeared the third year exam in 2007. This programme takes challenging demands of the market as well as the prevailing financial and managerial trends into consideration apart from the prescribed curricula. We hope our well – wishers will extend their co – operation as usual to this programme. Furthermore, it would be better to state; Pokhara Multimodal Campus is run by Pokhara Multimodal pvt. Ltd in the spirit of co – operative.